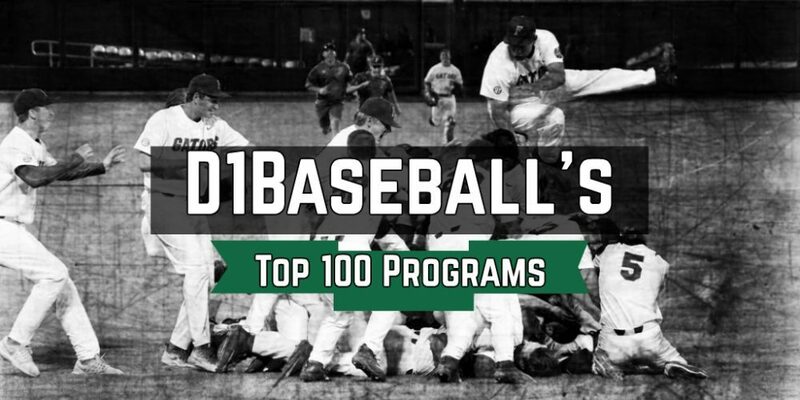 Over the last two weeks, we have counted down the Top 100 programs of the current era in college baseball, taking into consideration recent history, coaching staff quality, facilities, scholarship/financial aid situation, conference dynamics, and recruiting and player development proficiency. In the chart below, you can view all of the programs that made our list, and sort them by conference or state. The SEC led all leagues with 13 teams on our list, including four in the top 10 and eight in the top 20. The ACC was next with 11 teams in the Top 100, followed by the Pac-12 (10), Big Ten (nine) and Big 12 (eight). In all, 24 conferences placed at least one team on the Top 100. The state with the most teams in our Top 100 is California (14), followed by Texas and Florida (nine apiece). The table below shows the entire Top 100 and is sortable by conference and state.